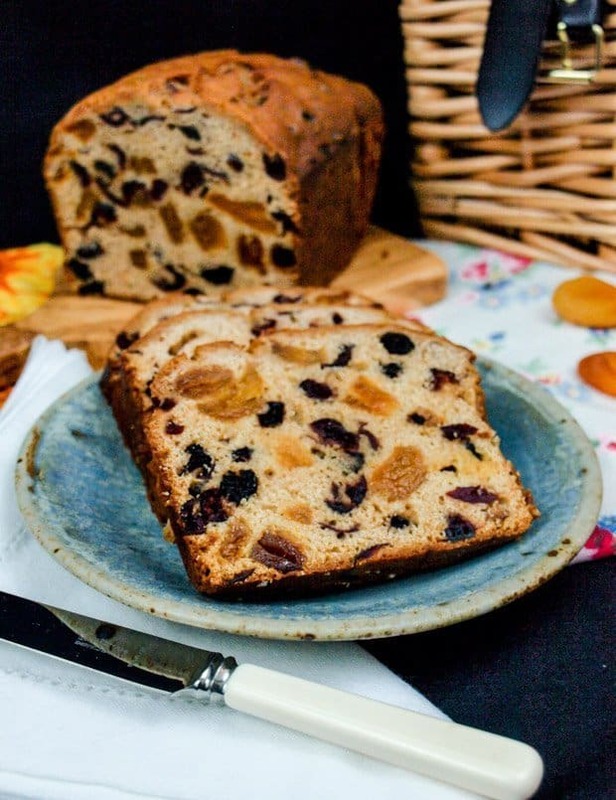 Apricot Tea Bread is one of my all-time cake tin favourites. It’s really simple to make you just need to plan ahead to soak the dried fruit in advance, then mix in the other ingredients and pop it into the oven. The resulting cake is sweet and moist and delicious, it even gets better if you wrap it in foil and keep it for a day or two. I do not remember a time when I did not love the taste of dried apricots. However, it is only relatively recently that the soft, plump ready to eat apricots we know and love have become available. The apricots I remember from my childhood and teens were hard and dry, that is until you soaked them in hot tea which they soaked up eagerly, turning into a luscious sweet treat. 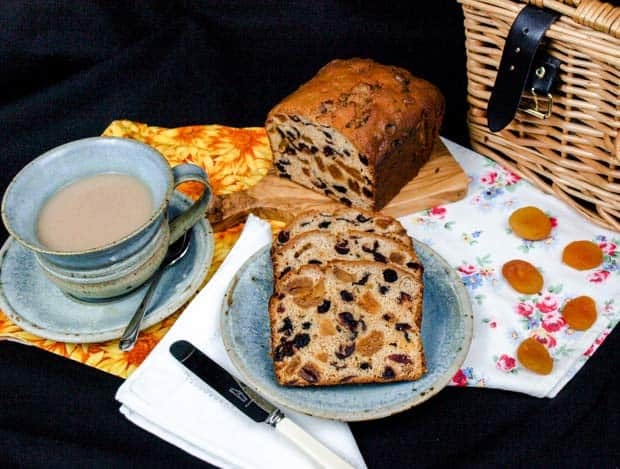 You will notice that I have used a variety of dried fruits in my Apricot Tea Bread, it is a very adaptable recipe and it’s nice to include some raisins, sultanas or, in this case, a mixture of dried cranberries and dried cherries. 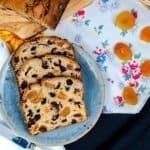 If you want to keep it simple, then you can use only dried apricots, cut them into halves or quarters with a pair of scissors and you will get a nice even spread of fruit across the tea bread with less risk of them sinking to the bottom of the cake. 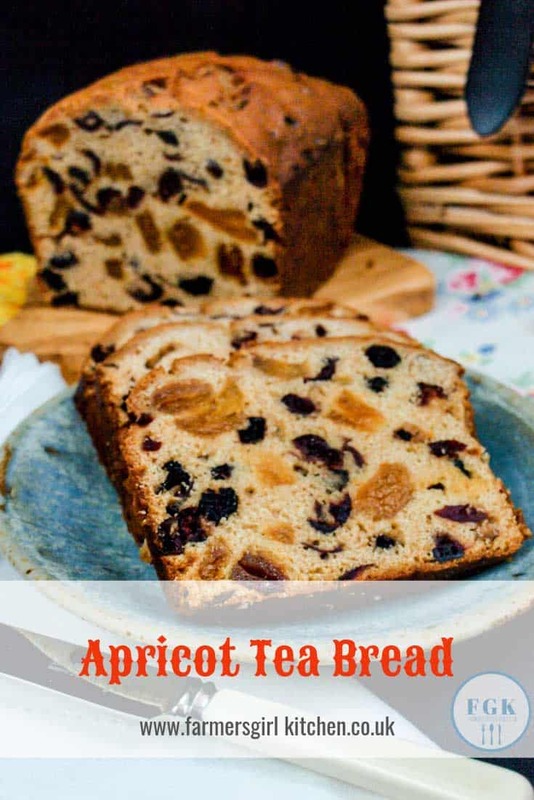 A rich and fruity tea bread packed full of delicious apricots and other dried fruits and oh so easy to make. Cut the dried apricots into halves or quarters, I find a pair of scissors is the best way to do this, although you can use a knife. Put the dried fruit and sugar in a bowl and pour over the hot tea. Leave it overnight to soak up the tea, but I didn't have time, so mine got 2 hours and was still pretty wet. Line a 900g/2lb loaf tin with baking parchment or one of those clever loaf tin liners. Add the flour, lemon zest and beaten egg to the fruit and tea mixture and stir with a spoon till mixed through. Leave to cool in the tin for 10 minutes then turn out onto a wire rack to cool. You can use all apricots or a mixture of apricots and other dried fruits like raisins, sultanas or dried cranberries. It looks lovely Janice – dried apricots are delicious. 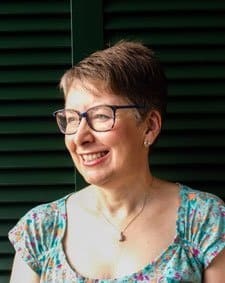 Oh I am a big fan of apricots too, the tip to soak them in tea is great as I think the plump ones you can get now have a few nasties in them as well as being more expensive so I’d much rather use the traditional dried ones! Thank you, Lucy. Prunes are also lovely soaked in tea. Thanks, Mandy. It’s definitely a favourite with us and a friend of mine has made it and had some great compliments. Your tea bread looks great, and I love how simple it is to make, and with so few ingredients. 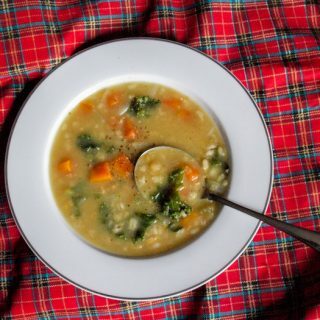 Thank you for including my recipe in your post! Thanks, Monika. Yes, it’s really easy to make and never fails me. That is one seriously gorgeous looking tea loaf! It’s been ages since I’ve made a tea loaf and I’m suddenly craving one with my afternoon cuppa. I’ll give this a try! Thank you, Elizabeth. You make such lovely bakes, I’m sure will whip up a tea bread in no time. I absolutely love fruit loaf and this looks packed with fruit. I would love a slice! Thank you, Nickki. You’ll need to make one so you can enjoy a slice! I love dried apricots too and we always have a bag of them in the cupboard. 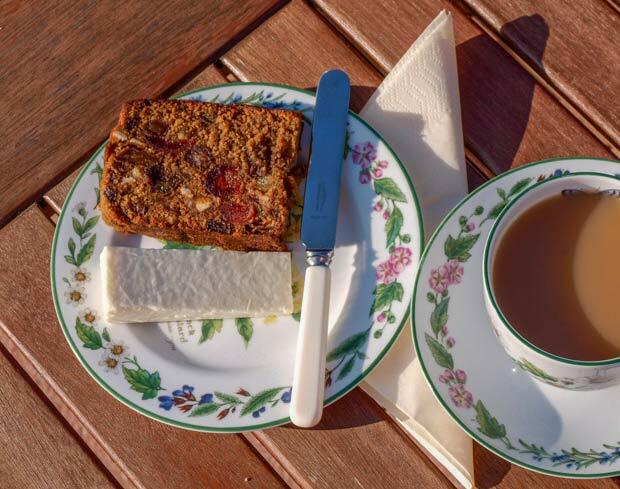 This tea loaf looks delicious with them in! Oh yes, they are so delicious and really make this tea bread special. Thanks, Cathy. It is perfect with a cup of tea. Thank you Kat, it’s a simple recipe but always turns out well. 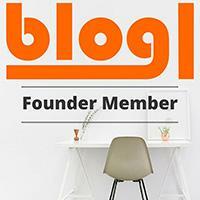 Thank you, it’s one I often forget about too, but oh how much fun to rediscover! 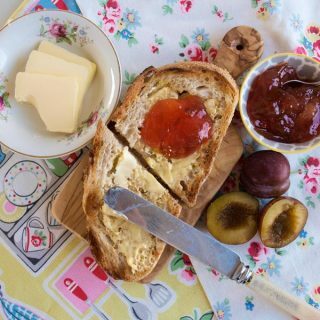 I don’t make enough tea bread, so thank you for reminding me of it’s wonderful versatility – this would be perfect to have on hand for 3pm nibbles I reckon! Thank you, Claire. Yes, it ideal for afternoon nibbling! Oh yum! You can’t beat a good tea loaf, especially spread with butter. YUM! Sharing this one now and drooling a bit too! Thank you, Jac. 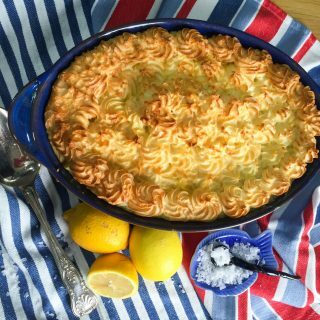 It is lovely with butter, but also good without as it is nice and moist. I’m all for traditional bakes at the moment, so this is getting a big thumbs up for me. Plus I love dried apricots – mmm! Traditional recipes do seem to be popular and dried apricots are also my favorite dried fruit. I love old fashioned tea breads/cakes. I sometimes like to soak my fruit in earl grey tea then I use some of the liquid in the tea bread. 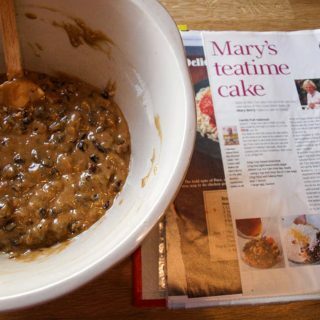 Earl grey is a lovely tea to use in a tea loaf. 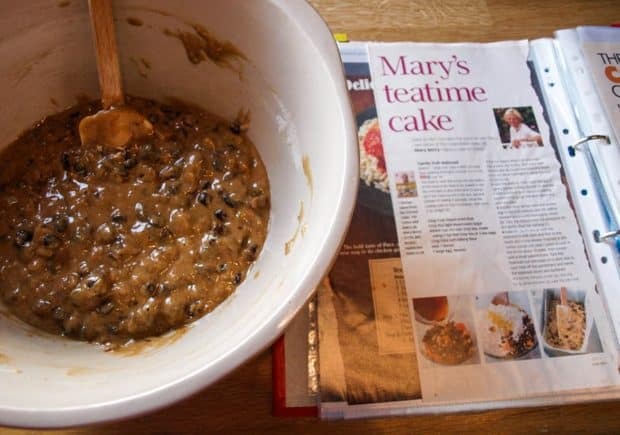 I haven’t made a tea bread in too long, your recipe looks divine Janice! Thank you, Camilla. 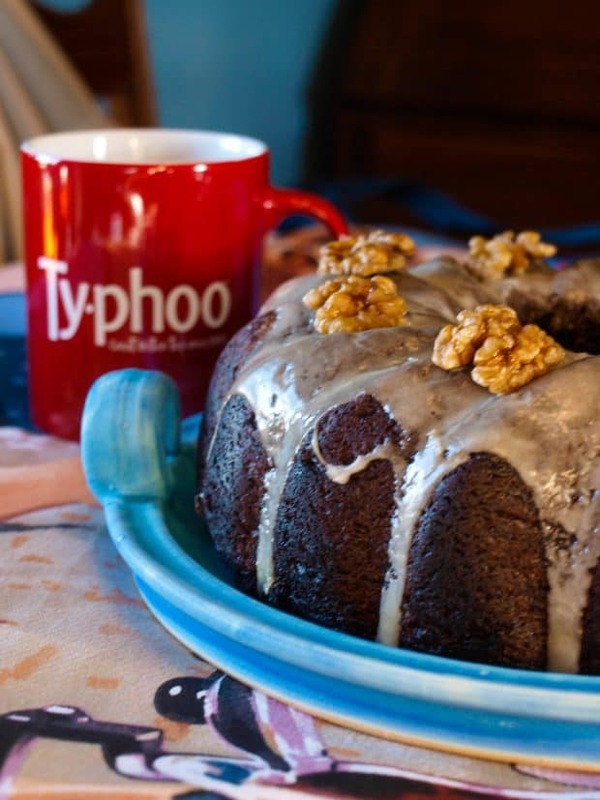 It’s a lovely cake to have in the cake tin or slice and freeze, so you can take it out as you need it.